We have all seen startling headlines of celebrities canceling a concert due to the flu or individuals dying from the illness. The flu is responsible for approximately 20,000 deaths per year on average in the United States, according to the Centers for Disease Control and Prevention. An effective, important way to protect yourself is by getting a flu shot. But there are many myths and misunderstandings about this vaccine. Here are some flu vaccine myths and truths. 1. Everyone needs the flu shot. True or false? True. For the 2018-19 influenza season the American Academy of Family Physicians recommends annual influenza vaccinations for anyone 6 months and older who do not have a health disorder that may cause a complication. The inactive influenza vaccine is also recommended for pregnant women. 2. If you got the flu shot last year, you do not need it again this year. True or false? False. The American Academy of Family Physicians (AAFP) recommends routine, annual influenza vaccinations. Each year different strains of flu could be present. It is important to be protected each year with the most recent predicted strains that could otherwise cause serious illnesses. A person receives the flu vaccine in this undated stock photo. 3. You can get the flu from the vaccine. True or false? False. The flu vaccine contains an inactivated virus, which means that you cannot actually get the flu infection from the shot. However, there are possible, mild side effects from the shot, including soreness, headaches, fever and nausea. You should seek medical attention if you develop symptoms of a severe allergic reaction such as difficulty breathing, hoarseness or eye or lip swelling. 4. There is only one type of flu vaccine. True or false? False. There are actually usually at least three types of vaccines available, made with different influenza strains. Currently, most places carry the quadrivalent inactivated vaccine. Your health care professional will individually determine which type of flu shot is best for you. 5. If you have an egg allergy you can still get the flu vaccine. True or false? True, with conditions. The AAFP and CDC both state that persons with a history of severe allergic reactions to eggs, which does not mean simply hives since that is a mild reaction, can be vaccinated, but should get their flu shots in an inpatient or outpatient medical setting instead of at work or a pharmacy. This includes but is not limited to hospitals, clinics, health departments, and physicians’ offices. Administration of the vaccine should be supervised by a clinician who is able to recognize and manage severe allergic reactions. 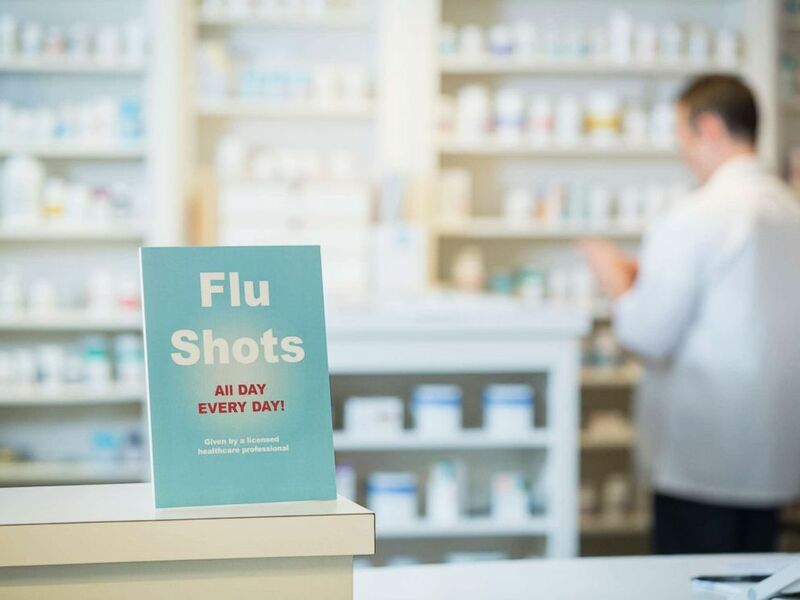 A sign for flu shots is pictured in pharmacy in this undated stock photo. 6. It is fine to wait until it gets colder to get the flu shot. True or false? False. Flu season can start as early as October and end some time in March, but you can get the flu any time of year. It is hard to predict the severity of each flu season or strains and the length of duration that can put you at risk. So, if you have symptoms of the flu outside of designated flu season seek medical help. 7. If you are pregnant, don’t get the flu vaccine since it can harm your unborn child. True or false? False. 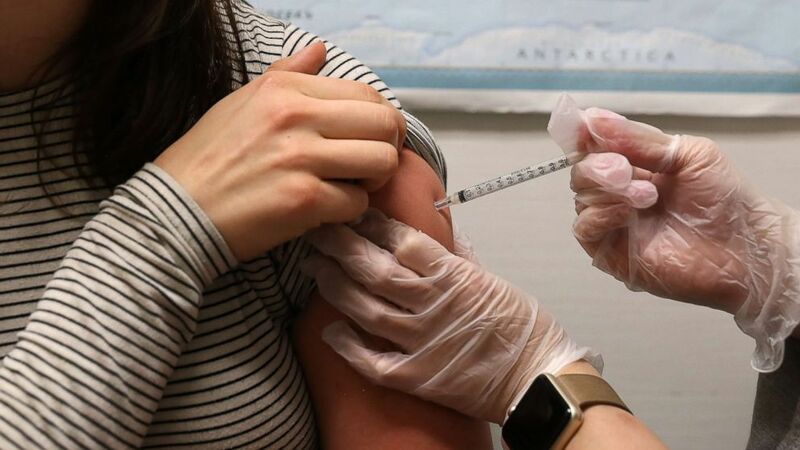 Pregnant women should receive the seasonal influenza vaccine as pregnancy puts them at greater risk of falling severely ill if they get the flu. The inactive type of vaccine given to all pregnant women is not known to cause any risk to the baby. 8. If you are feeling well, you should still get the flu vaccine. True or false? True. Although certain people — including the elderly and people with compromised immune systems — are more likely to develop life-threatening complications from the flu shot, anyone can get sick from the flu. Also the flu shot like other vaccines works best through what is called “herd immunity,” meaning the more people that get the vaccine the less the disease is to spread. 9. The flu vaccine causes autism. True or false? False. Numerous studies have looked at this issue and have found no link between vaccines and autism, the CDC says. 10. You can only get the flu shot from the doctor’s office. True or false? False. Grocery stores, pharmacies as well as doctor’s offices and hospitals offer flu shots. It does not matter where you go because they all use the same vaccine. It’s important just to get the flu vaccine as soon as possible.